Location was convenient from the motorway. Staff in adjoining hotel were friendly and helpful. Breakfast was simple but adequate. You get what you pay for. Clean an d comfortable. Easy access from the main road and parking in front of the property. Room size was good also, the bed very comfortable. Friendly staff and very nice breakfast for the money. Proximity to the motorway. OK for an overnight stay. Reception was very friendly and arranged taxis for us when leaving. We were in the budget hotel but received discount vouchers for the restaurant next door. Nice and quiet. Handy for the bus stop. Once we found it all was ok .Good place for stopover,and a good breakfast for the money. The free parking and the surrounding area was quiet. good parking in front, easy to find. Comfortable bed. Quick check in. Cheap and cheerful. Good if travelling with pets. 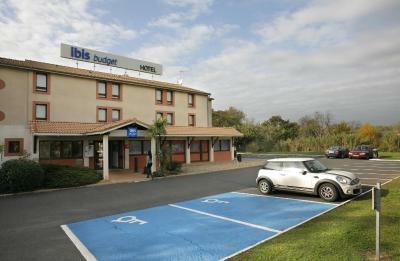 Ibis budget Béziers Est Mediterranée is located in 1.9 mi from Béziers city center, 650 feet from Mediterranee Stadium. Exit 64 on highway A75 is a 3-minute drive away. Les 9 Ecluses is 3.1 mi away, and there is a beach 5 mi from the property. Free secured parking is available on site. 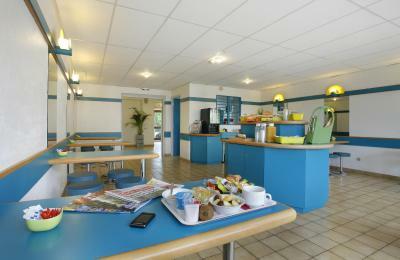 A buffet breakfast is served daily and you will find luggage storage space at the property. 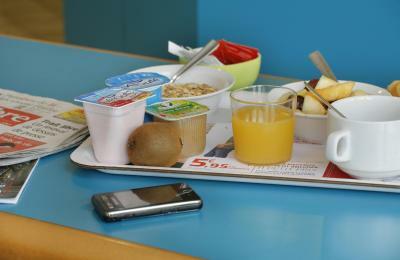 Guests may dine at the restaurant in hotel Ibis Béziers Est Méditerranée, located 150 feet away. Beziers Arena is 2.5 mi from Ibis Budget Béziers Est, while Saint-Nazaire Cathedral is 3.1 mi away. The nearest airport is Beziers Cap d'Agde Airport, 6.2 mi from Ibis budget Béziers Est Mediterranée. 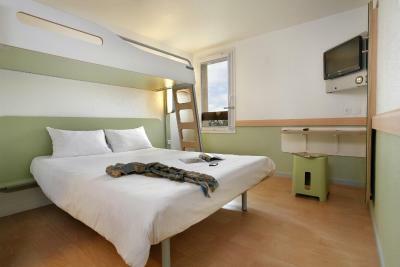 When would you like to stay at Ibis budget Béziers Est Mediterranée A9 / A75? 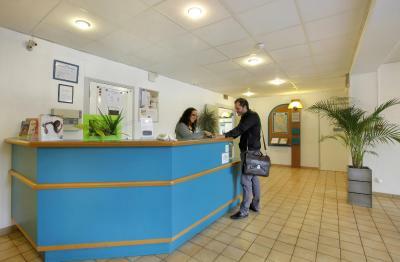 House Rules Ibis budget Béziers Est Mediterranée A9 / A75 takes special requests – add in the next step! Ibis budget Béziers Est Mediterranée A9 &#47; A75 accepts these cards and reserves the right to temporarily hold an amount prior to arrival. Ibis budget Béziers Est Mediterranée A9 / A75 accepts these cards and reserves the right to temporarily hold an amount prior to arrival. Location was fine, as not too far from the motorway. Breakfast was good value for money. There was a kind of party on the main floor making noise. Shame on. Breakfast is so basic for the price payed, I recommend they improve it. We have stayed in other IBIS budget hotels on route in Europe and have been very happy however this was not up to standard expected. Just because it is cheap does not mean it should not be clean. The room was in need of decoration and cleaning. Walls and floor were dirty. 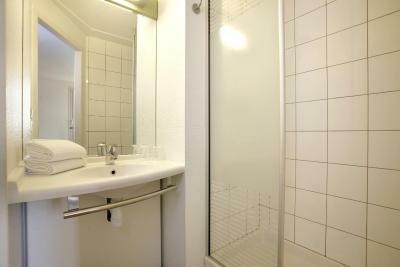 The 'IBIS' décor had been applied but the standard of decoration and cleanliness were not of the standard as expected. The common areas were dirty and smelt strongly of smoke as did the room. Small room small shower and the whole building seemed neglected. We were on the ground floor as requested. I didn't like that we couldn't control the room temperature. Also, I think the shower could be improved, as the water goes everywhere flooding the bathroom. Surprisingly, the English level of the staff was quite low. But we managed to make it work. Breakfast is quite expensive at €6.50 per person. Even with the 10% discount voucher to eat at the IBIS Hotel next door, it was costly. €9.50 for a 50cl carafe of house red!!! Well over the top for what it was. The room ventilation was poor. Nothing to dislike,you get what you pay for,minor gripe some of the lights did not work. The hotel was not easily found as was not noted on our satnav. The Avenue le Vigulier was recognised but this was not where the hotel seemed to be located. Paid more than initially quoted with taxes added on.